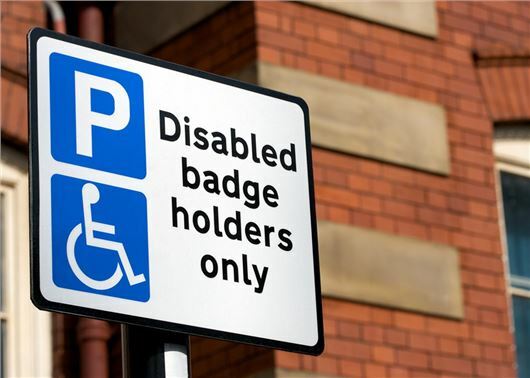 People with hidden disabilities, including autism and mental health conditions will have access to Blue Badge parking in England from 2019. It marks the biggest overhaul of the Blue Badge scheme in 40 years and will allow more people with disabilities to park closer to their destination. The changes follow an eight week public consultation, which ran from 21 January to 8 March 2018 and received more than 6000 responses from across the country. Although people with non-physical disabilities were not excluded from receiving a Blue Badge under the old scheme, the rules were open to interpretation. The Government says the new criteria will give clear and consistent guidelines on Blue Badge eligibility for the whole of England. The Blue Badge scheme currently gives preferential parking to 2.4 million disabled people in England. Where can you park under the Blue Badge scheme? Park for free on streets that are subject to metres or pay-and-display machines. Park on many single or double yellow lines for up to three hours. Use disabled parking bays for as long as necessary, unless there is a displayed time limit. How are the rules changing? People who have a disability that affects their mobility can already apply for a Blue Badge, along with those who are registered blind. From 2019, the scheme will be extended to include a wide range of hidden disabilities, such as mental health, stomach conditions, arthritis, lung problems and chronic pain. What is the new criteria? Specifically, the rules apply to people who cannot undertake a journey without there being a risk of serious harm to their health or safety or that of any other person (such as young children with autism). It also applies to those who cannot undertake a journey without it causing them very considerable psychological distress or have difficulty when walking. Can I use a Blue Badge with any car? Yes. The Blue Badge is linked to the person with the disability and not the vehicle, so you can use it with any car you’re travelling in. How can I apply for a Blue Badge? You can find out more and start the application process by clicking here. Only 6000 responses from across the country. Just shows that these Public consultations ( whatever the subject) are kept hidden from the general public. There should be a minimum amount of responses and if not they should announce them on the news. A lot of laws and other bits and pieces are getting past by using under the radar tactics. Just as an example, how many people knew about these changes to the law regarding the Blue Badge system. I am not against the Blue Badge system, only the way it is being abused. My mother had the use of one great idea until you see abled bodied people misusing them and genuine people having to park miles away. I think the ‘blurb’ is rather misleading. It would be more truthful to report the this ‘concessIon’ is just a reinstatement of what was taken from the Blue Badge scheme some 2/3 years ago. Since then a number of interested parties have been working behind the scenes lobbying the government to get the benefit returned to those with hidden disabilities. Those with similar problems are (or were lm open to correction) entitled to a bus pass. Remember not ‘all’ disabilities can be seen and the vehicle driver can/may be using the passengers Blue Badge entitlement to get them, not themselves, to places. It's unfortunate that blue badge usage is abused..There needs to be more done to protect against misuse..There are so many genuine cases that have to make other provisions for the use of disabled parking spaces..A great scheme abused by a small but visible minority. I think the blue badge should be available to those with walking/mobility issues. I am not sure why someone with mental health issues would need to park closer to wherever than anyone else, unless they cannot walk in open spaces or something. So this is going to lead to a considerable increase in disabled parking spaces being created in car parks, on street parking/metres being taken up by able bodied people (but with some mental health issues), all meaning less car park and on street parking for the rest of the population.. I agree, if a person has serious mobility issues they should park close to their destination to minimise walking, a person with mental health issue CAN walk a bit further. We are in danger of getting to the situation where people with pushchairs are dumped off buses so the space can be used by the wheelchair user who gets on the bus. I await the first case where someone on sticks or a mobility scooter has to park in a 'normal' bay because the local 'anxiety group' have taken all the disabled spaces. I think this is bordering on the ridiculous. The whole thrust of Blue Badges should be solely for the use of persons with a physical disability, and that is the reason why the Blue Badge spaces are near to the entrance of buildings etc. Autistic people and persons with a mental problem are not physically impaired. The other anomaly concerning Blue Badge Holders is that in certain parking spaces and on street parking, they are exempt from charges. Does it follow, therefore, that a Blue Badge is a statement of impoverishment? Some of the cars I see in Blue Badge spaces do not indicate a below standard of living that requires a subsidy. The provision to park much nearer to one's destination is extremely laudable, but it does not follow that applicable charges to others should be negated. As someone who is disabled with extreme walking problems I have to say it's becoming a joke. Blue badges should be awarded to people who are entitled to the maximum mobility allowance through the PIP system. It was brought in to enable those of us who are genuinely impaired and unable to walk through medical reasons. Why it enables us to free parking I don't know. Just because I am registered disabled does not mean that I live in poverty. I think things are once again going in the wrong direction. Just look at the number of blue badge parking spaces there now are in residential areas where people have driveways.yes the system has and is being abused, one way to help stop it is to make sure that people are in recite or PIP and to stop the free perks. I read the papers and watch news on tv but never knew about this consultation. People who inflict disabilities on themselves should not be included. It needs enforcing though so that badges aren't swapped about in families, I know someone whose elderly mother has a badge and he uses it when doing her shopping!!!!!!! It's a surprise that this government has done this after introducing the bedroom tax and other benefit changes. I know that some Disabled people today are not really Disabled and give actual Disabled people a bad reputation. There are a man and his son who live opposite me, they have DISABLED bay and both have Blue badges, however they both can do as much as any able bodied person, they walk half mile to get papers in the morning, repair their cars, cut the grass etc. They both have walking sticks and when nobody is around they don't use them. The bay is shared with all their family, if their other son or family member is coming round they move their own cars so the family member can park in the bay, and they don't have a blue badge or disabled, its a family parking bay. Their son brings round his jet ski and everyone washes it in the bay. Its just disgusting that they are coning the government out of their disability payments, if the government actually spent time and caught these fraudsters the country would have more money to spend. I have tried to find out how to report this misuse but not found anything online to report them. The whole system is becoming a joke and an insult to those that really need it. It has been watered down over thd years and we will get to the stage soon where there will be more disabled spaces than those for able bodied. Councils seem to hand out blue badges without question. Are they too scared to question a person's eligibility? Of course let those that need one have one. I am always amazed to see people with a blue badge park in a car park then go off and shop for hours. If they are disabled they shouldn't be able to do this. I also don't understand how they are allowed to park on double yellow lines. Yellow lines are there for a reason aren't they?